When we got home from vacation we discovered our garden was full of ripe sweet peppers, one of the few things that has done well in the garden this year. 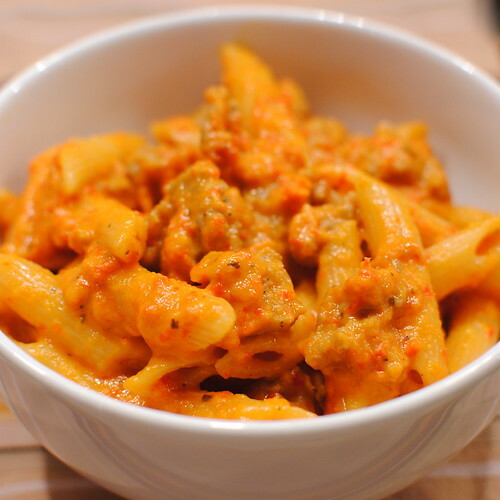 Since there were so many of them, I decided to turn them into a flavorful sauce for pasta. This is such a great change from your run-of-the-mill tomato sauce for pasta. The color and flavor of the sweet red peppers are definitely the star of this dish. We used a sweet, fruity, Italian pepper called Jimmy Nardello's, but I think regular red bell peppers would work just as well. We love Italian sausage with red peppers, so we added some cooked bulk sausage to the sauce before pouring it over the pasta. It would be just as good without it though. Make the dish completely vegetarian by using vegetable stock instead of chicken. Heat the olive oil in a large skillet over medium-high heat. Add the onions, garlic and peppers. Sauté until everything is tender and the onions are just starting to brown, about 30 minutes. Put the onions, peppers and garlic into a blender or food processor with 1/2 cup of the chicken stock. Purée until almost smooth. Return to the skillet. Add the remaining chicken stock, tomato paste, lemon juice, basil, oregano, pepper flakes and salt. Let simmer for 30 minutes stirring from time to time. Stir in half and half. Heat through. Thoughts for making this again: Next time I might try roasting the peppers, onion & garlic in the oven before puréeing them to see if that give it even a deeper flavor. Great idea! Think I'll give it a go too. Looks delish! Thanks for sharing the idea and the recipe. Looks wonderful, Kathy! Our peppers are doing only ok this year. I think out of 6 plants, we've got about 4-5 good sized peppers. Weird! This sounds SO good. I need to buy some peppers while they are still cheap!! I should try this recipe. I love spicy and try to incorporate spiciness in most of my dishes. I love that about you guys. The way you come up with things. Very inspirational. This sounds really tasty. I roasted a bunch of red peppers last summer and used them all winter. They stay so nice. They are like fast food- all the roasting is already done. fantastic use for a bunch of red peppers! frankly, this leaves marinara sauce in the dust as far as i'm concerned!